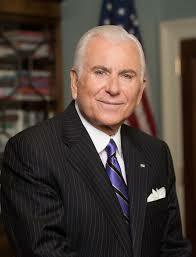 Before becoming president of High Point University in North Carolina in 2005, Nido Qubein was a successful businessman, professional speaker and author known for engaging audiences with topics such as leadership, branding and change management. He has since led the university through an extraordinary transformation, including tripling both undergraduate enrollment and the number of faculty, adding 90 new and acquired buildings on campus, and adding four academic schools. Always eager to learn, Qubein has interviewed numerous prominent leaders and innovators, including Gen. Colin Powell, Apple co-founder Steve Wozniak, best-selling author Malcolm Gladwell and others, about human development, peak performance and personal success. Qubein will share that knowledge and more as a keynote speaker at UBTech 2019 in Orlando, Fla. Your UBTech presentation is titled “The World As It Is Going To Be.” Can you give us a preview? I believe it’s a reflective title to say that we should all be focused on the future, we should all have a clear vision about where we want to go, and we should have a solid strategy for getting there. We should employ practical systems in all that we do, and we should dedicate ourselves to consistent execution, even when challenges become compressed and very demanding. My presentation will be about leadership; it will be about personal and professional growth; it will be about overcoming adversity in any form, business or otherwise; and it will be about seeking abundance in all that we do and in the way that we do it. You mentioned clear vision. What was your vision when you came to High Point? I came to High Point at a time when one journalist referred to it as a “dusty old college.” In other words, it was not a place that was innovative, and it certainly was not a place that was attracting many students. Fiscal resources were diminishing as was the ability to build for the future. I had one primary vision: to create relevance. It is not just relevance for students, but relevance for faculty and staff who will be challenged every day to be the best heroes, models and mentors for students. We did four things. First, we knew that we had to create value—people had to be able to see that we offer value. Second, we had to interpret the value. Very often, we fail to interpret value from the perspective of the receiver; value then is reduced in its quantitative and qualitative importance. Third, we had to remove irritants from the system. We used to do everything on paper when I came here. We didn’t even have Wi-Fi. So we invested hundreds of millions of dollars making sure that our campus was not only up with the times, but anticipatory of the needs of the tomorrows of our lives. Finally, we added all kinds of things on our campus to create a “wow” experience—in the physical plans, our people and the quality of our academic programming. We’ve been very successful at it. For example, today we have up to 12,000 applications for 1,400 spots in the freshman class. How did you instill that growth mindset in your team? The same way we do everything else here, which is on a continuum of learning and a continuum of communication. For example, every month we have faculty meetings that will, of course, address the business of the day, but we also have time to acknowledge each other for work well done. We will talk about culture. I will read letters I get from students. I will apprise them of the developments in all aspects of our work. One way to build a growth mindset is to tell people that there are no unrealistic dreams; there are only unrealistic timelines. You have to believe in the art of the possible. I don’t care what business sector we’re engaged in; we have to have a can-do attitude. You have to believe down to your core that nothing is impossible and that you can make things happen. Maybe you don’t have the resources or competence today, but you can acquire them. One way to build a growth mindset is to tell people that there are no unrealistic dreams; there are only unrealistic timelines. How do you acquire them? Through mentorship, through coaching, through collaboration and so on. We focus on a growth mindset because we have no other choice. Our school is growing so fast. We have gone from building brand awareness to building brand preference (more students prefer to visit our school) to building brand insistence (more than 40 percent of our freshman class is early decision because this is the only school they want to go to). Finally, we’ve reached brand advocacy, in which parents, counselors, friends and alumni advocate the school in ways that make this cycle of success spin even faster and better. So the growth mindset is about the fact that while you are meant to be extraordinary, you still have to pay your dues and you have to travel the path and you have to cross your Rubicon to get there. Mentorship is about acknowledging that I do not have all the answers, and even when I do have some of the answers, it is a wonderful habit to run some of those ideas by someone I trust. We all need mentors in our lives. I live my life in a continuum of learning. I get up every morning by 4 a.m., and I study until 6 a.m. I read reports that are directly related to High Point University. I read periodicals such as yours and others. So mentorship is not always about physically sitting with another human being and going over ideas. You could be mentored by a book, or by a video, or by listening to a speaker or a panel. The issue is not the conduit; the issue is your willingness to be a learner. What do you hope that UBTech attendees will take away from your presentation? I hope that they will take away three things. I hope they’ll be inspired that the world that lies ahead of us is filled with opportunities, and it is up to each of us to step up and partake of these opportunities. I hope that they will be reminded of some fundamentals that are foundational for our success. And I hope they take away a sense of commitment to the passion of what we do. You make a decision with your brain; you make a commitment with your heart. When we are passionate—not only about the mechanical part of what we do, but also about the application and the outcomes—we will be encouraged that we are doing important work. Stakeholders gathered to join East Stroudsburg University and Stroudsburg Little League officials in dedicating the new artificial turf athletic fields.